Wie bereits vor einigen Wochen von den Entwicklern angekündigt wurde, haben sie im Verlauf des heutigen Nachmittags nun endlich den neuen Content Patch für Heroes of the Storm auf die amerikanischen Liveserver dieses Team Brawlers aufgespielt, der leider erst während der heute Nacht stattfindenden Wartungsarbeiten in Europa erscheinen wird. 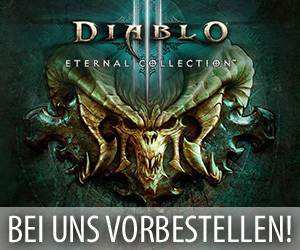 Aus diesem Grund veröffentlichten die Mitarbeiter von Blizzard Entertainment vor einigen Stunden dann auch noch die endgültigen englischen Patchnotes zu diesem Event auf der offiziellen Communityseite dieses Titels, die einmal ganz genau auflisten, was für Neuerungen und Änderungen dieser Patch den amerikanischen Spielern bisher zur Verfügung stellte. Bei dem Highlight aus diesem nachher dann in Europa erscheinenden Update handelt es sich um den ersten Teil des auf Starcraft 2 basierenden Events „Kriegsmaschinen“, der unter anderem den neuen Helden „Alarak“, ein weiteres Spielfeld mit dem Namen „Endstation Braxis“, einige interessante Skins für den Shop und die Suche nach Artefakten der Xel’naga als spezielle Aufgabe im Questlog der Spieler mit sich brachte. Zusätzlich dazu beinhaltet dieser Patch selbstverständlich auch wieder eine Reihe von Fehlerbehebungen und eine Vielzahl von Änderungen an den spielbaren Charakteren von Heroes of the Storm, zu denen ihr in folgenden englischen Patchnotes genauere Informationen findet. We just released a new patch for Heroes of the Storm, which brings a new Event, Battleground, and Hero to the Nexus, as well as UI improvements, balance changes, and more! Check out today’s patch notes below. NOTE: Orange text indicates an addition that was made between the Public Test Realm and final versions of the patch notes. Xel’naga artifacts have begun to appear all across the Nexus, and SCVs are being deployed to collect them. Terminate these interlopers with extreme prejudice and collect artifact pieces to earn some sweet new rewards! Collect 12 Artifact Pieces during a single game. Collect 150 Artifact Pieces before the Machines of War liftoff from the Nexus on October 18, 2016. SCVs and Artifact Pieces will have a 50% chance to spawn at the start of a game if any players on the team have not yet completed their Artifact Hunt Daily Quest. This task will be difficult to accomplish alone! Teammates must work together to eliminate the SCVs and reclaim the Artifact Pieces before the game begins. After downloading today’s patch and logging into Heroes of the Storm, all players will be able to add a new Hero to their collections for free! On login, players will be able to pick one of the following three Heroes: Anub’arak, Thrall, or Tyrande. If any of those Heroes are already owned, they will be replaced by Nazeebo, Sonya, or Uther on the selection screen. Players who already own all six of these Heroes will automatically receive 4,000 Gold instead. Learn more by reading our recent blog post. This has been done to increase the frequency with which players encounter the new Battleground, Braxis Holdout. A second group of 6 Battlegrounds will replace those listed above during the week of September 26, and the reduced Battleground pool will remain in effect until the Machines of War event concludes during the week of October 17. 0 games played: Players will only receive matches on Cursed Hollow. 5 games played: Players can now be matched on any of the Battlegrounds listed in the reduced pool mentioned above. Not all heroes are born of altruism. . . some, like Alarak, simply desire vengeance. As the new Highlord of the Tal’darim, Alarak leads his people to a destiny free of the corrupt influence of the fallen Xel’naga, Amon. You deal 100% bonus Ability damage versus enemy Heroes. After a 0.5 second delay, deals damage to enemies in front of you and silences them for 1.5 seconds. Push yourself and any enemies hit from the targeted point toward the targeted direction. Enemies pushed by Telekinesis also take light damage. Deals damage to an enemy and all enemies between you and the target. You are also Healed for 75% of the damage dealt to Heroes. Become Protected and channel for 1 second. If you are attacked during this time, you will send a shockwave forward that damages enemies in its path. Channel and then charge in the targeted direction, dealing damage to all enemies in your path. Charge distance increases based on the amount of time spent channeling, up to 1.6 seconds. While channeling, movement commands will cancel Deadly Charge at no cost. Taking damage will interrupt channeling. The Dominion used the remote and hostile planet Braxis to conduct experiments on ways to turn the Zerg swarm into a weapon they could unleash on their enemies. Though the Dominion’s main psi disrupter was destroyed, this space platform’s beacons remain fully operational and ready to be used. Capture the beacons and watch what happens when a flood of weaponized Zerg ravages the battlefield. Several Battlegrounds have received additional optimization to help improve performance. The Butcher has received updated visual effects to coincide with his Talent rework. Medivh’s Portals have received additional visual polish to make their presence on the battlefield more apparent to allies. The Imposing Presence Talent has received updated visual effects to coincide with its new functionality. Machines of War Bundle – Available starting September 13 until October 18, 2016. Gain early access to all of the StarCraft-themed items from the Machines of War event by purchasing the Machines of War Bundle. Click here for complete Machines of War Bundle details! Herald of N’zoth Alarak Bundle – Available until September 27, 2016. 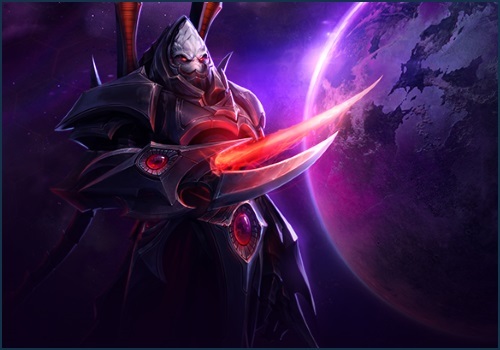 Alarak has been added to the in-game Shop. * This item is exclusive to the Machines of War Bundle until it is officially released at a later date. Click here to view a full release schedule for Machines of War items. ** The Obsidian Cyberwolf Mount is exclusive to the Machines of War Bundle, but may return to the Nexus at a later date. Even the music of Heroes of the Storm has been invaded by the Machines of War! Enable music in the Sound Options menu (or press CTRL+M) to listen as the sounds of the Koprulu Sector clash with those of the Nexus. All Heroes should now properly play voiceover lines when clicked repeatedly. Medivh’s Portals have received some additional sound effect polish to make their presence on the battlefield more apparent to allies. The Lost Vikings have received unique death notification sounds which should be a little less jarring for allies. The Spell Shield and Imposing Presence talents have received updated sound effects to coincide with their new functionality. The Breaking News icon will no longer display in the menus when there is no breaking news to read. The Health bar color for the player’s own hero has been changed from dark blue to yellow. Neutral Mercenaries will now appear dark purple on portions of their models that use team colors. This should help players and observers better differentiate them from captured mercenaries. Any Hero selected during Ranked or Unranked drafts will now count toward progression of any role or universe-specific Daily Quest. This has been done so that players can still complete their Daily Quests while picking the best Heroes for their team composition, rather than Heroes who satisfy a quest requirement. Daily Quests are now available to all players, beginning at account level 1. This is the only Daily Quest that level 1 players can receive and will only be available until account level 11. After reaching level 11, it will be replaced by the Play 8 Games quest. Players can now show off their individual prowess on the field of battle via the MVP System and end of match commendations. Five players will receive awards for their in-game performance and individual achievements at the end of every game played in any mode except Custom Games. Each match will feature one MVP, or Most Valuable Player, and four other players will receive awards for specific in-game feats. The MVP award is granted to the player who had the greatest overall impact on the match, which is determined by their performance across all in-game stats. The remaining four match awards will be granted for a wide variety of achievements, such as top healing, longest killstreak, most Doubloons turned in on Blackheart’s Bay, and so on. End of match awards, including MVP, can be granted to players on either team, regardless of victory or defeat. Once the awards have been given out, all ten players can then commend the award recipients to show appreciation for their in-game accomplishments. Players who receive many commendations at the end of a match will also be rewarded with a little extra fanfare. Award-specific icons will also appear on the end of game stats screen next to the name of each player who received an end of match award. Click here to read our recent blog post on the End of Match Awards System. Searching for a Hero during Draft Mode or Hero Select will now sort the results first by the Hero whose name most closely matches the player’s search terms. For example: Searching for “Diablo” will now show Diablo as the first result, followed by all other Heroes from the Diablo Universe. Toggle Favorites: Heroes who have been marked as favorites in the player profile will be sorted to the top of the Hero list. The maximum number of Hero League Grandmaster players has been reduced from 500 to 200. The Team League maximum remains at 100 players. Players will no longer receive a flat 250 ranked point adjustment after winning a promotion match or losing a demotion match. Instead, these matches will now award or remove the same amount of points as a normal ranked game. Upon earning enough ranked points to reach a promotion match, any points earned beyond the 1,000 point division cap will now be stored and applied at the end of the promotion match. Winning a promotion match will now award any excess points that were stored prior to that match in addition to the normal ranked points earned for the win. Losing a promotion match will subtract the normal ranked points for a loss minus the number of excess ranked points that had been stored prior to the promotion match. Demotion matches do not store lost ranked points, and losing a demotion match will only cause the player to lose the normal amount of ranked points. Enemy Minions killed near you grant a stack of Bribe. Use 20 stacks to Bribe a Mercenary, instantly defeating them and permanently increasing the damage of Lightning Rod by 5%. Does not work on Bosses. Maximum of 80 stacks. Developer Comments: See Falstad’s comment for Bribe changes. Developer Comments: See Greymane’s comment for Relentless changes, and Falstad’s comment for Bribe changes. Stuns and Roots grant Resistant, reducing damage taken by 25% for 3 seconds. Developer Comments: See Greymane’s comment for Relentless changes. Activate to consume all Hatred stacks. For each stack lost, reduce all ability damage by an additional 3% for 5 seconds. This ability has a 5 second cooldown. Basic Attacks now grant 2 stacks of Hatred and the time before Hatred expires is increased by 2 seconds. Developer Comments: We realize this rework may come as a bit of a surprise to our community, especially since Valla’s Talent diversity has always been pretty good. The roots of the redesign have been floating around the design bullpen for 6+ months, and after some initial testing we felt like we had to pull the trigger and get it out to you. Similar to Zagara and our other large reworks, we didn’t want to change the ‘feel’ of the Hero —Valla users should still feel completely at home while playing her. Our main goal was to increase the potential for amazing Valla players to differentiate themselves from the mediocre ones and aimed the majority of these changes toward lifting her skill-ceiling. We believe that players will still be able to build Valla very similarly to the ways they have in the past, but with more interesting and potentially powerful payoffs. We are excited to bring the new Valla to our community and look forward to hearing what you all think! Stuns and Roots against Kharazim grant 50% damage reduction from Basic Attacks for 4 seconds. Displacement Grenade no longer explodes on contact and passes through everything. After a 0.0625 second delay, players can now re-activate the Grenade causing it to explode on command, damaging and displacing enemies. Displacement Grenade automatically explodes if it reaches max range. Developer Comments: Alongside the adjustments to Mount speed, we’re also reducing the Movement Speed bonus offered by Rehgar’s Ghost Wolf Trait. Developer Comments: When looking at Burrow Charge, we liked that this Ability provided an immense amount of mobility and allowed Anub’arak to dive the back line, but we didn’t like that he had an Invulnerability on a 16 second CD. Essentially, Anub’arak could hold this to completely nullify a Pyroblast or any huge damage source, which is not intended. By changing this to Unstoppable, we still allow Anub’arak to be very slippery and get out of bad situations quickly. Using Surging Fist grants Resistant, reducing all damage taken by 25% for 3 seconds. Reduces the cooldown of Surging Fist by 4 seconds if it hits an enemy Hero. Developer Comments: As our heroes develop over time, we often find niches for their roles that are only available via Talents. While we love that our Talents augment our Heroes in interesting ways, we are wary when a Hero is picked specifically for a role that they are given via a Talent. We did a pass on our current roster and found a couple of these cases in Johanna and Muradin. We like how Johanna is seen as a warrior with good wave clear, and how Muradin is seen as an anti- auto-attacker. We’ve decided to make these features part of their base kits, and will be keeping an eye on others in the future. Now also applies the 25% Attack Speed slow with the second activation of Thunder Clap. Developer Comments: See Johanna’s comment. Whenever Stitches is Stunned or Rooted, reduce basic ability cooldowns by 3 seconds. Repeatedly changing Region and Language settings to and from Chinese will no longer limit region selection to China on the login screen. Fixed an issue that was preventing a small number of players from rejoining games. Core: Fixed a bug in which Shield impact effects on the Core were not displaying when struck by some Abilities. Keep: Flags will no longer appear detached from a Keep’s model when it is heavily damaged. Artanis: Activating Twin Blades just as Hearthstone completes channeling will no longer cause Artanis to stand while Mounted. Rehgar: The Totemic Projection Talent now uses the correct icon tint. Tomb of the Spider Queen: Medivh will now properly fly over the Spider Queen’s Altars while in Raven form, rather than path around them. Towers of Doom: Sappers can sometimes stop attacking their targets and start following enemy Heroes. Try Mode: Brightwing can now properly Phase Shift to the Healing Dummy. Try Mode: Helping Hand is no longer removed from Stitches’ Ability bar after clicking Reset Talents. Try Mode: Repeatedly casting Stitches’ Gorge on the Target Dummy will no longer prevent it from leashing back to its spawn location. Fixed several bugs in which splash damage from Basic Attacks could still deal damage while the attacking player was Blind or the target was Evading. Fixed an issue that could cause Tyrael, Uther, and Gall players to incorrectly receive AFK Warnings due to the combination of their post-death effects and lengthy death timers at later levels. Anub’arak: Beetle damage listed in the Scarab Host Trait tooltip will now update correctly when Anub’arak levels up. Auriel: Sacred Sweep’s increased range, gained by learning the Majestic Span Talent, will now correctly benefit from the Righteous Assault Talent. Chromie: Temporal Loop’s clock graphic will no longer disappear if the target becomes polymorphed. Dehaka: Isolation’s parasite will no longer visually persist until death on a target that was simultaneously hit by Isolation and Chromie’s Time Trap. Diablo: Apocalypse will now correctly target enemies trapped by Anub’arak’s Cocoon. E.T.C. : Rockstar’s Attack Speed bonus will now be properly applied when E.T.C. casts Stage Dive. Gall: An icon has been added to the buff bar for the Dark Descent Talent, and the icon’s tooltip will track Runic Blast damage bonuses earned via Hero Takedowns. Gul’dan: Learning the Health Funnel Talent and using Drain Life to kill a Hero with a post-death effect, such as Uther, will now properly reduce Drain Life’s cooldown. Johanna: Condemn will now be correctly interrupted when Johanna becomes Polymorphed. Kerrigan: Using the Overdrive Talent will no longer remove the Energizing Grasp Talent’s Mana cost reduction for Primal Grasp. MULE: Will now properly acquire a new repair target if the Structure it is actively repairing is destroyed. Murky: The camera will no longer automatically snap to Murky’s Egg location if he is killed with camera follow enabled. Nazeebo: Zombie Wall will no longer attack Murky’s Pufferfish. Li Li: The Shake it Off Talent will no longer reduce the duration of the Garden Terror’s Queen’s Curse Ability. Lunara: Fixed a rare issue in which casting Leaping Strike toward terrain could cause Lunara to run back to her original location after landing. Lunara: Will no longer receive the “Stuck” notification when a Wisp is stuck by Tracer’s Pulse Bomb. Rexxar: Misha’s Basic Attack target can now correctly be switched by right-clicking as long as she did not already have an order to Focus on a particular target. Rexxar: Misha can now push Minions and allied Mercenaries, but will not push enemy or uncaptured Mercenaries. Uther: The tooltip for the Gathering Radiance Talent will now properly indicate the amount of bonus Healing and Damage earned after multiple nearby Allies are hit by Holy Radiance. Sgt. Hammer: Basic Attack range indicators should now appear consistent while Sgt. Hammer is in both Tank and Siege Modes. Stitches: Vile Gas applied by a Retchling after learning the Restorative Fumes and Indigestion Talents will now properly Heal Stitches, rather than the Retchling. Tychus: Attack commands should no longer automatically switch targets after using Run and Gun. Xul: Skeletal Warriors will no longer attack Murky’s Pufferfish if it is in their path. Zagara: After learning Medusa Blades, Zagara will now deal the correct amount of damage to her secondary Basic Attack targets. Zeratul: Void Prison will no longer cancel Rehgar’s Feral Lunge or Olaf’s Charge as long as the target of either Ability is still in range when Void Prison ends. Color Blind Mode: Fixed an issue which caused damage and Heal over time effects in Hero Health bars to display in red and green while Color Blind Mode was enabled. Death Recap: Zagara’s Healing received from the Hydralisk Transfusion Talent will now be correctly displayed in her Death Recap. Draft Mode: Fixed an issue that could cause the draft interface to become unresponsive if the player’s game client was minimized while entering draft mode. Replays: Pausing a replay prior to opening the Talent Panel (TAB) will no longer prevent Quest Talent progress from displaying.